The quarterly results in smartphone sales are in and as always the IDC's statistics make very interesting reading! 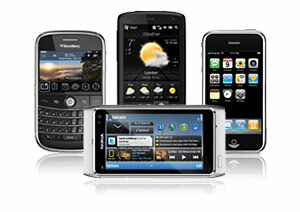 The most interesting data from our point of view is the smartphone data and that is what we'll consider. 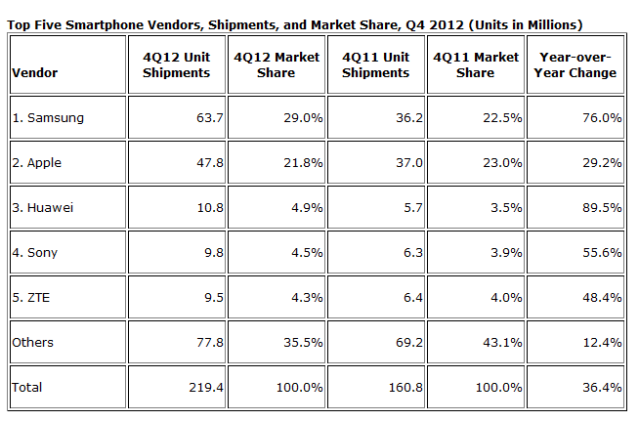 Naturally Samsung and Apple turned out to be number one and two in terms of shipped devices just like normal. But, after those normal candidates we've seen Huawei leapfrog Sony into third place and there's ZTE bringing up fifth place! Interestingly everyone inside the top five saw growth in double digits and there was exceptional growth for both Samsung and Huawei, both of whom saw growth above 75% year-over-year! Every one else did well, but we were surprised to see Huawei's Chinese competitor ZTE only record growth just above 10%! With regard to smartphone sales in general they were all quite high in Q4 2012, there were 219.4 million units, which equates to 45.5% of all mobile phones, which is the highest percentage ever sold. This was a solid growth of 36.4% year-over-year, although the IDC were slightly disappointed that this came in below their forecasted growth rate of 39.5%! For the whole year though the totally added up to 712.6 million smartphones which were shipped in the whole of the year, a 44.1% increase from 2011.